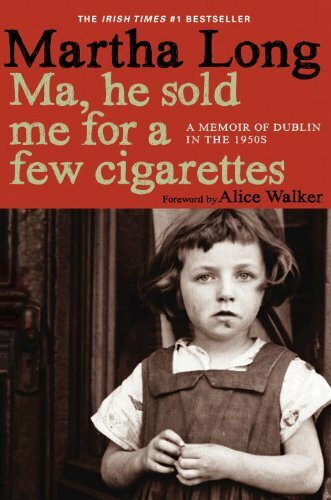 Martha Long’s Ma, He Sold Me for a Few Cigarettes is the first in her series of five memoirs and covers her life from age 4 through age 11 in 1950s Dublin, Ireland. This harrowing memoir chronicles the horrific and systemic sexual and physical abuses Martha Long suffered, ordeals largely perpetrated by her stepfather, Jackser—a cruel and vicious alcoholic enabled by Martha’s mother and by a church and society that for the most part looked the other way. Ms. Long’s memoir is particularly admirable for the great compassion and perspective it demonstrates. The author devotes much space in the work to fully fleshing out Jackser and her mother, sympathetically showing them to be terribly flawed, co-dependent, and very human, themselves both victims of inconceivable abuses. Ma, He Sold Me for a Few Cigarettes also goes beyond seeking sympathy for its author and forcing the reader to witness catastrophic misery and trauma, instead memorializing the amazing spirit of a little girl and ultimately the human spirit. So now I know not everyone is like Jackser. Ye’re not supposed to go mad an hurt people. An not everyone is like me ma. Other mammies don’t let other people hurt their childre. I’ll never copy Jackser again. An I’ll never be like me ma. I’ll be somebody when I grow up. People will respect me. Overall, the book would have benefitted from more stringent editing. The consistent use of working class Dublin colloquialism versus using the dialect only in dialogue might grate and runs the risk of making the work less accessible. There’s also repetition and redundancy throughout, and haters of the exclamation point will feel perturbed by its overuse. That said, the fierce heart of this work and its writer beats out any issues around craft. Ma, He Sold Me for a Few Cigarettes is a difficult, painful, and at times almost unbearable read. Yet this memoir should be widely read and discussed at length so that we may discover the worst and the best of ourselves. So that we may be called to action and play whatever part we can in ending these inconceivable but very real crimes against children and humanity everywhere. At almost 500 pages, this devastating memoir propels readers to the end by implicitly posing one burning question: How did Martha Long survive such unimaginable betrayal, injury, and suffering? The answer is like the fuse burning up and the dynamite going off: Despite the agony, survivors know at the deepest level within their souls that they were born to live out better destinies.